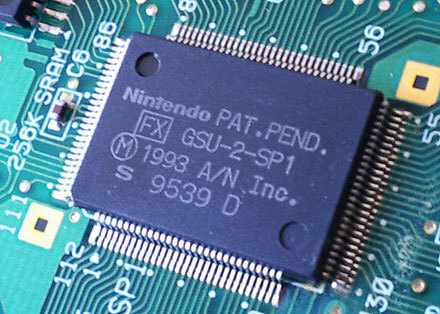 My SNES interests mostly lie in the SuperFX chip. It's best known for being used by Star Fox to render 3D graphics. It was also used by Super Mario World 2 to do improved/fancy 2D graphics. Many are under the mistaken impression that the SuperFX is a dedicated 3D processor. In reality, it is a simple general purpose RISC processor with an extremely orthogonal instruction set. It lacks even a jump instruction (you load the PC directly, of course). Given that the SuperFX a general purpose CPU, this means that Star Fox actually contains a software 3D renderer. I tried my hand at reverse engineering the code for this, but it proved very difficult. The furthest I got was finding the matrix math routines (i.e., the mult operations) and nop'ing a few. All I really have to show for it are some slightly messed up ROMs. Feel free to play with my NOP'd Star Fox roms. Try the training stage.